The Easter weekend stretches from Friday April 19 until Monday April 22 2019. A two-day bank holiday resulting in four days away from the workplace for many people. With the weather looking up, now is the perfect time to seize the opportunity and get to work on some of those DIY projects you’ve been meaning to nail for a while. And us Brits love to do it ourselves. With our ‘have a go’ attitude, sometimes there’s nothing more satisfying than rolling up our sleeves and mucking in, to get the job done. According to an Aviva Home Report, as a nation of DIY lovers, UK families typically spend £16 billion per year fixing things that need some attention around the home. On average, that’s £589 per household*. With this in mind, leading high street retailer Robert Dyas has compiled a list of handy hints, tips and products to help you in and around the home this Easter weekend. So, whether it’s unblocking a drain, mending a garden fence or constructing a new tool shed, be sure to pin down a project this Easter. Carpe diem! Nothing says new quite like a fresh lick of paint. Whether it’s redecorating your sitting room, experimenting with a new colour scheme or simply touching up scuff marks, give your home a new lease of life with emulsion or gloss finishes. Don’t let your inner Monet ruin your soft furnishings. Keep furniture, carpets and surfaces splatter-free with this Harris 12 x 9 Cotton Dust Sheet (£10.99). Redecorating a bedroom or got some old wallpaper to strip away? Try this HG Wallpaper Remover (£5.29) for a no-fuss, hassle free job. Fail to prepare, prepare to fail. Keep your paint jobs looking perfect by prepping every surface. First of all, sand down the old paintwork and then prepare with this Dulux Multi-Surface Primer and Undercoat – 750ML (£21.49). Need to brush up on your paintwork? Keep it simple with this Harris Platinum 5-Piece Paintbrush Set (Was £9.99 now £4.99). Including three sizes, you’ll be able to paint the finishing touches all over the house, no matter how big or small the job. Protect your bathroom walls from mould for up to five years with a tin of Dulux Bathroom Soft Sheen 1L (£14.99). Where would humankind be without his tools? From the latest technical power utensils to the simplest hand tools, they’re an essential part of life as we know it. Especially when it comes to DIY. Why not treat your own handyman to a Makita G-Series 18V Cordless Combi Drill with 74 Accessories (Was £174.99 now £129.99)? The perfect practical present for the DIY lover in your life. Keep edges and surfaces silky smooth with this Bosch PSM Primo Multi Sander (£39.99). With it being hand-held and collecting dust , you’ll make light work of rough toil. Don’t forget the basics. Hang up those picture frames perfectly with this Draper 4oz Cross Pein Pin Hammer (£6.49) and add some Select Picture Pins – 15 Pack (£1.79) to adorn your walls in style. Construct your very own workbench with this Black & Decker Workmate Self-Assembly Workbench (£29.99). It makes the ideal accompaniment for any DIY jobs in and around the house and with a handy foldable feature, will store away easily when not in use. Tools don’t always come with sharp edges and can take their form in various guises. No need to call out the plumber. For blocked drains or kitchen sinks, try this HG Kitchen Drain Unblocker 1L (£6.49). Got a scale that needs shifting? Try the Kilrock Big K Multi-Purpose Descaler – 400ml (£3.99) for an effective and thorough way to keep limescale at bay on your washing machine, shower head or coffee-maker. Now that the sun is shining, keep your glass and windows sparkling with this HG Glass & Mirror Spray (£2.49). For a streak free finish, why not use a Karcher Easy Window Vacuum Cleaner (£44.99)? Use this cordless window cleaning vacuum to remove grime and dirt from your windows, leaving them preened and polished to perfection. Need some extra privacy? Take back control with this D-C-Fix 2m Self-Adhesive Film – Damast (£4.99), perfect for window panes to add some discretion to bathroom activities. What’s more, it adds an attractive finish to your windows, without losing any daylight. Clear as cut glass. DIY doesn’t have to include hammer and nails. If you’re a lover of tradition and have gathered friends and family for an Easter feast, why not try your own version of DIY and host a roast? This Pyrex Set of Two Rectangular Roasters (£12.69) will help you create the perfect dish, every time you turn on the oven. Sometimes it’s hard to think of venturing outdoors when the forecast looks glum. But whatever the weather, spring has sprung and with summer only around the corner, now is the perfect time to get out there and start making your garden look gorgeous again. Outdoor furniture taken a battering by the winter weather? Treat it to some TLC with this Cuprinol Garden Furniture Restorer 1L (£8.49). Perfect for weathered teak or hardwood, your garden goods will be looking as good as new in no time. Taken delivery of some new sun loungers or table and chairs? Get prepared for al fresco entertaining and keep furniture looking pristine all summer long with this Cuprinol Ultimate Furniture Oil 1L (£14.99) to ensure sun and water damage doesn’t ruin your new best friends. Keep your brush strokes neat with a handy Harris Transform Three Inch Woodstain Oil and Varnish Brush (£8.49). As the name says on the proverbial tin, the ideal companion for all of your outdoor maintenance painting needs. Wishing your wheels were gleaming? Treat your car or bike to the spring clean it deserves, all done by your own fair hands. For cleaning with ease, try the Turbo Scrub Lite Cordless Household Cleaning Brush (£24.99). Had a bump? The T-Cut Rapid Scratch Remover (£7.99) will save you time and money spent at the garage, by removing surface scratches and blemishes from your precious paintwork. And for a traditional finish, use this Hilka Genuine Chamois Leather (£9.99) for a pristine polish. 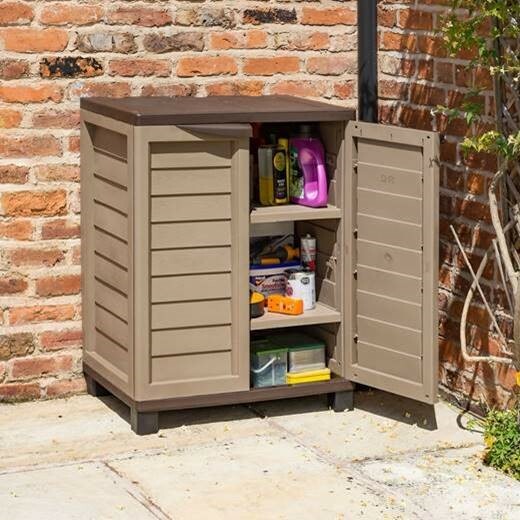 Ensure your garden gear and precious tools are kept safe all year-round with this Rowlinson Heritage Wooden Wall Store – Grey (£269.99). Featuring lockable double doors and a roomy interior, you can store outdoor equipment protected from both the elements and light fingers. And after all of your hard-earned efforts, don’t forget to look after yourself. Treat your hardworking hands to some O’Keefe’s Working Hands Hand Cream (£7.99) to keep those mitts in pristine and polished condition. Afterall, they need to stay prepared for the next job! This press release was distributed by ResponseSource Press Release Wire on behalf of Robert Dyas in the following categories: Men's Interest, Entertainment & Arts, Leisure & Hobbies, Home & Garden, Women's Interest & Beauty, Media & Marketing, Retail & Fashion, Construction & Property, for more information visit https://pressreleasewire.responsesource.com/about.